Welcome to City View Manor where this NORTH WEST CORNER unit, with two bedrooms and one bath, features a PRIVATE wrap around balcony, beautiful DOWNTOWN VIEWS, a laundry room (complete with a FULL SIZE WASHER AND DRYER) an UNDERGROUND PARKING stall and a storage locker! With new windows and doors, this space has been COMPLETELY reimagined to create an OPEN PLAN, perfect for entertaining! With BRAND NEW, STUNNING, WIRE BRUSHED HARDWOOD floors, QUARTZ countertops, STAINLESS STEEL appliances, front load washer and dryer and BUILT IN closets in the bedrooms! Everything in this latest Hightest project is brand new, hasn't been lived in AND has a ONE YEAR LABOUR WARRANTY! AND the LOCATION!! Voted #1 community in Calgary, the Beltline provides a lifestyle that is unmatched in the City! You are within 5 blocks of grocers, diners, shops, 24 hour fitness club, restaurants, spas, cafes, pubs, professional services AND Calgary's first Inner City dog park! Call you favourite realtor today!OPEN HOUSE SUN Mar 5, 1-3! Seller is offering a $5,000 VISA Gift card to the Buyer upon a firm sale!! 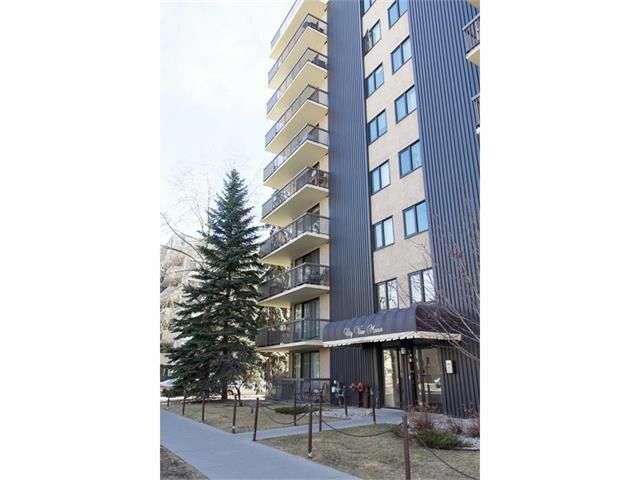 City View Manor is not a conversion building (a building that was originally built for only rental suites), this building was built as condominiums and has been well maintained with high owner occupancy! 2nd floor has a common space SUN DECK! Buyer only pays $400/month for condo fees for ONE YEAR!! Condo fees are $565/monthly covering heat, water, sewer, insurance, contributions to Reserve Fund, building caretaker, maintenance, landscaping, snow removal, you only pay electricity which runs between $20-30/monthly.